An everyday scene in a French coastal harbour. The tide is out, leaving only patchy areas of water. Most of the ships are lying high and dry. A group of people are standing chatting near a boat. On the right, two men are looking on from the quayside. It is late afternoon. The sun is setting, painting the misty sky greyish-pink. Vague contours of houses and ships are visible in the distance. Only the dilapidated tower and the quay can be seen clearly. Wijnand Nuyen painted this watercolour in 1836, inspired by a journey through France. On his travels he met French and English Romantic artists. 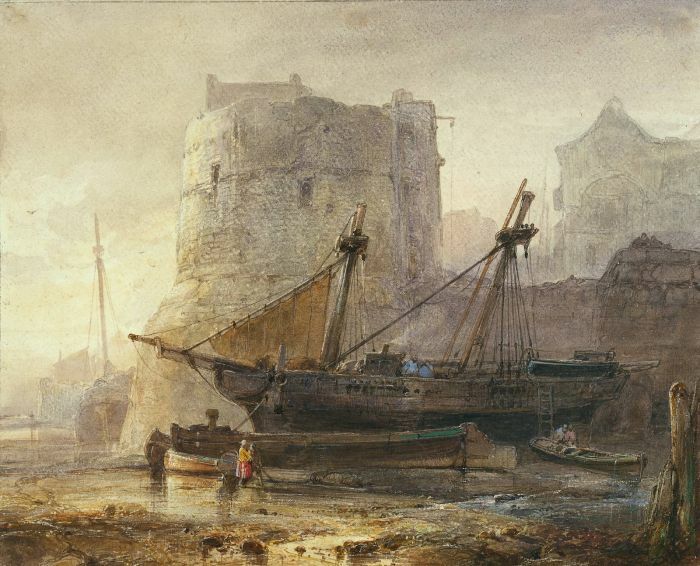 Their influence is clearly visible in this dreamy harbour scene. SPECIAL NOTE : The painter will make the reproduction as close to the original oil painting as possible. If you want your painting to alter from this likeness, please email us and " Ships in a French Harbour, 1836 " will be reproduced according to your special requirements.